The Princess Laura Swarovski headband from Aristocrat Tiaras centres on a large flower created from 10mm white pearl and crystal beads surrounded by smaller pearl flowers with seed beads flowing down away from the flower along the band creating an exotic wave effect. The headband is encrusted with crystal clear beads along its visible length to create an amazingly eye-catching effect. The Princess Laura crystal headband is perfect for a stunning bride on her wedding day. Princess Roza earrings and necklace from our wedding jewellery collection are designed to compliment this crystal brdial headband. 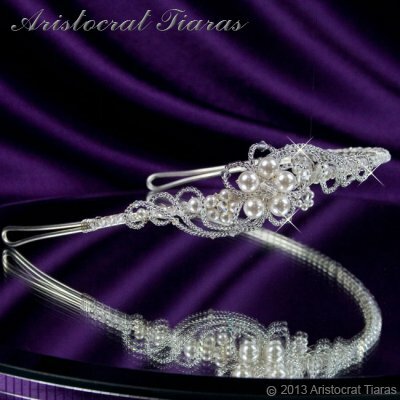 All our bridal tiaras are handmade in Herefordshire UK. Colours and designs may vary slightly from the picture.